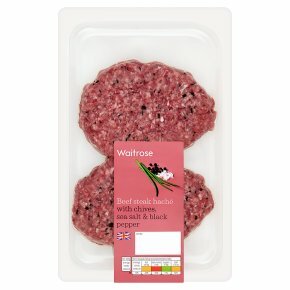 INGREDIENTS: British beef (97%), chive, sea salt, black pepper. Grill Time: 14-18 minutes. Grilling Instructions: Preheat grill. Place on a grill rack under a medium heat turning occasionally until thoroughly cooked, the juices run clear and there is no pink meat. Time: 14-18 minutes. Pan Fry. Preheat 1tsp of oil in a frying pan. Pan fry on medium heat turning occasionally until thoroughly cooked, the juices run clear and there is no pink meat.